My name is Liz Seville. Because of my longstanding multiple sclerosis, I have learnt to seek interest and meaning in my life through creative things. This blog is about the textures, ventures, people and places which bring me pleasure in my life. I hope you’ll find something in here to interest or please you. If not, then please pass by. I am not trying to write literary or artistic criticism. There are many who can do so far better than I. Instead I am trying to provide a few stopping off places which might inspire you to work with your own creative self. I am particularly interested in linking with others who are engaged on a similar journey. I owe particular thanks to five individuals who have greatly enriched my life. The first is my lovely husband with whom I have been able to attend some of the best theatrical productions and artistic exhibitions the UK has to offer. The second and third are two former colleagues, now great friends, who have helped me towards engagement with my creative self by being ever willing to bounce exploratory bubbles in the air. The fourth is an extremely talented textiles tutor at Birmingham’s Midlands Art Centre who fed my love of colour and beautiful, tactile things. The fifth is a lovely friend who inspires me whenever the world seems bleak by her own dedication to her creative and artistic self. May you find something to please you. I found you on another blogger’s long line of commenters. I can’t help but wonder if she is the ‘fifth’ . Anyway, your place is lovely here ! Thank you. Yours too, I like that green bag balancing on a rock! I just added you to my blog reader. I don’t think it shows up for you. I thought you would like to know you have another follower. Thanks for the follow. Love your gallery! 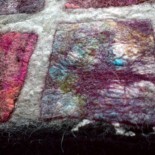 One of the neat things about hand-made felt is seeing the wonderful ripple texture that seems universal for felters. So beautiful! Inspirational blog, Liz. Looking forward to following your adventure.